Christian Bale cites the mannerisms of Tom Cruise as his inspiration for Patrick Bateman in American Psycho. 2. Dolphins give each other names and will answer to it even when called by dolphins they don't know. 3. The world’s biggest helicopter MI 26 can carry other smaller airplanes and even helicopters. 4. Around 300 A.D., during the Qin Dynasty in China, government officials would use fingerprint analysis at a crime scene to help identify potential perpetrators, as they knew that no two people have identical fingerprints. 5. In 2012, the Smithsonian officially recognized video games as an art form and had an exhibit to "comprehensively examine the evolution of video games as an artistic medium." In 2013, many regions in the United States, mostly being the state of Hawaii have tried solving their homeless problem by providing one-way plane tickets out of the area. 7. Before the 20th century, the death of the Pope used to be confirmed by striking him in the head with a silver hammer. 8. The reason movie crews use a "Clapperboard" (the blackboard they clack at the begging of a movie scene) is to help sync the audio and video together later. 9. Cows never existed in the wild and were domesticated from wild ox some 10,500 years ago. 70% of lotto winners spend all their winnings within 5 years, and it doesn't matter whether they won $1 million or $100 million. 12. In 1851, when the refrigerated ice machine was patented, the large ice-importing industry ran a smear campaign against the technology, calling it immoral. 13. The largest centipede named Arthropleura ever existed (280 million years ago) was tall enough to rear up and look a human in the eyes. 14. In zero gravity, a candle's flame is round and blue. 15. There is a coast-to-coast hiking trail called The American Discovery Trail that connects Delaware and California. 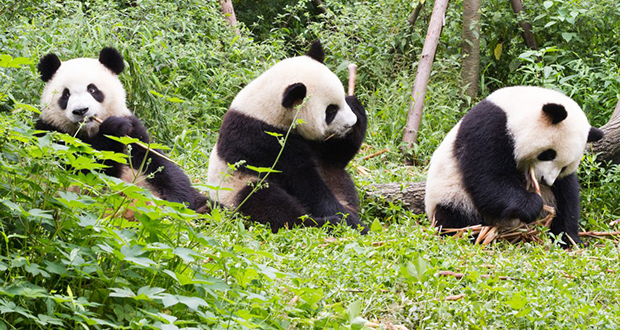 Pandas were carnivorous, but they inexplicably lost their appetite for meat during evolution. 17. When Robert Taylor inventor of soap-in-a-pump-bottle (Softsoap), he knew larger competitors like Colgate would try to copy his product. In order to ensure that they couldn't copy him, he bought every small bottle hand-pump (100 million bottles) in the United States. This resulted in a year of the market to himself. 18. The artificial sweetener Sucralose (Splenda) was discovered when a researcher misheard a command to "Test this chemical" as "taste this chemical." 19. After winning an Oscar, actor Daniel Day-Lewis retired to become a cobbler in Italy, only returning to acting after Martin Scorsese convinced him to star in Gangs of New York. 20. Fourteen years after publication, Dr. Seuss removed a reference to pollution in Lake Erie from The Lorax. Researchers informed him that the environmental efforts to restore the lake had been successful. The line was changed in subsequent editions. Bios Urn turns the ashes from a person's cremation into a tree by using them as a nutrient source for a seed. 22. A town in Russia named Verkhoyansk with an average temperature of -45 °C (-50 °F) in January was attacked by a pack of 400 wolves in 2012. The sun currently rises at 2 pm and sets at 3:30 pm. 23. In 1922, Americans were consuming 1 million Eskimo Pies a day that resulted in the rise of the cost of cocoa beans by 50%. This single-handedly lifted Ecuador's economy out of a depression. 24. The "cost per GFLOPS" (the cost for a computer that would operate at one billion floating-point operations per second) in 1997 was of $42,000, while nowadays it is of merely $0.03 in 2017. 25. In 1575, a German mass murderer nicknamed Puschpeter is reported to have kept his wits after being impaled. The stake hit his spine and he berated the executioner. Puschpeter commanded the executioner to draw the stake out of him and gave instructions for how to make the impalement properly.